The other day I was in the bathroom and brushed too vigorously breaking the handle. No, not my toothbrush…. the toilet brush! I am semi-domesticated, which probably surprises you! I seem to have a thing about brushes (toilet, paint, tooth) but fortunately, to date haven’t mixed them. Anyway, Jan headed off to Tesco early for a replacement brush and a second thermal vest. She returned with the brush but the vest looked suspiciously like bananas. It was then my turn to take the small petrol can to the service station. The 3p a litre discount resulted in a saving of 28p. Every little helps! 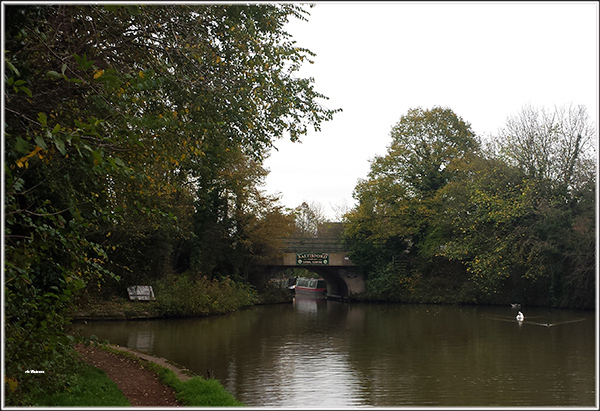 Jan happened to notice the CRT enforcement officer walking along our mooring taking numbers. That would be the third time in the last 10 days our number has been taken. We headed off at 10.00am leaving our fellow overnight boaters on the 24 hour moorings and headed towards Budbrooke Junction. Only two locks today. As we approached Cape Bottom lock I noticed the water from the lock was being released which resulted in a change of plan. We would take the lock and fill at the water point above the top lock rather than the one adjacent to the bottom lock. 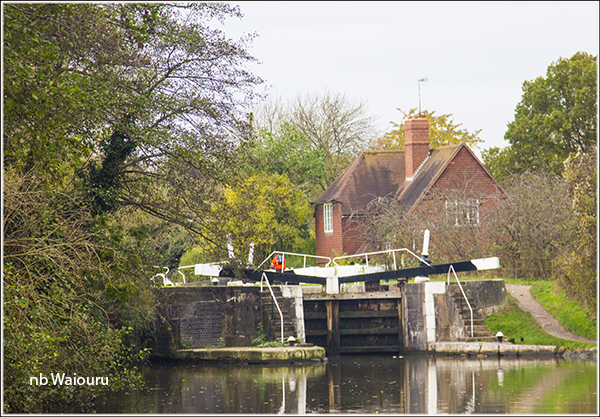 As the boater leaving the lock passed us he mentioned a single boat was going up the Hatton flight. Nice of him to mention that we might have a locking partner but we aren’t going up the flight. As the boat had just come down the two locks the next one was also in our favour. Even better, a boat arrived above the lock and two of the crew assisted us up. We stopped to top up the water tank above the lock and I noticed the “new” stainless steel water up-stand was missing its padlock. Probably the first of many! I hadn’t realised that Jenny Craig lived opposite the water point. 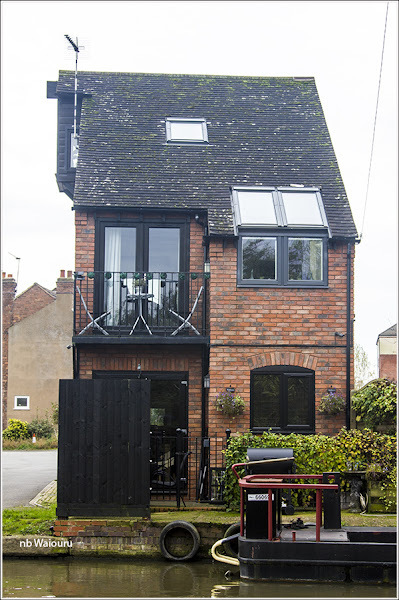 It has to be one of the skinniest houses I’ve seen in my life. We winded at Budbrooke Junction and reversed back towards the Hatton Flight mooring just beyond the junction and opposite the entrance into the Saltisford Arm. Last time we were this way we managed to get a 24 hour visitor mooring in the arm but at this time of the year they will all be occupied by winter moorers. After getting Waiouru sorted we walked across to the arm in the hopes of finding one of the nicest couples on the cut. And we were successful. 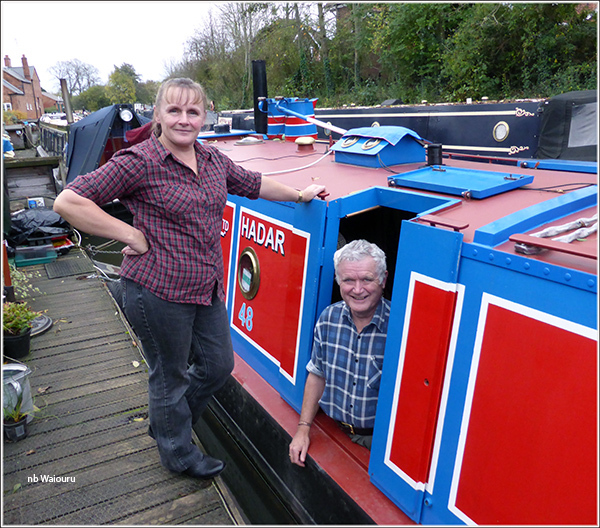 Jo and Keith were aboard Hadar. We had an enjoyable couple of hours catching up on news since we last met over a year ago. During that time Keith has had his ups and downs. However it looks like he is now on the road to recovery. Tomorrow a walk into Warwick is on the agenda.